Saudi Arabian Airlines (known as Saudia) declares on its English-language website that the kingdom bans "Bibles, crucifixes, statues, carvings, items with religious symbols such as the Star of David." Until the Saudi government changes this detestable policy, its airline should be disallowed from flying into Western airports. Michael Freund brought this regulation to international attention in a recent Jerusalem Post article, "Saudis might take Bibles from tourists," in which he points out that a section on the Saudia Web site, "Customs Regulations," lists the forbidden articles above under the rubric "Items and articles belonging to religions other than Islam." From the Saudia website in English. Freund followed up by calling the Saudia office in New York, where an employee identified only as "Gladys" confirmed that this rule really is applied. "Yes, sir, that is what we have heard, that it is a problem to bring these things into Saudi Arabia, so you cannot do it." An unnamed official at the Saudi consulate in New York further confirmed the regulation. "You are not allowed to bring that stuff into the kingdom. If you do, they will take it away. If it is really important to you, then you can try to bring it and just see what happens, but I don't recommend that you do so." Responding to the Saudi ban on churches and Bibles and Stars of David, some would ban mosques, Korans, and crescent moons in the West, but that is clearly untenable and unenforceable, given the freedoms of speech and worship. The Koran, for example, is not a Saudi artifact and cannot be held hostage to Saudi policies. However closely it identifies with Islam, the Saudi government does not own the religion. Further, as Stephen Schwartz of the Center for Islamic Pluralism points out, signs in Saudi airports warn Muslim travelers that the airport's mutawwa'in, or religious police, confiscate Korans, other Islamic literature, and Muslim objects of non-Saudi origin. While discriminating specifically against Shiites and Ahmadis, this policy manifests a wider insistence on Wahhabi supremacism. More broadly, the Saudi leadership runs a country that the American government has condemned repeatedly as having "no religious freedom" and being among the most religiously repressive in the world. 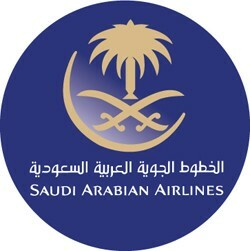 Saudia is probably the only civilian airline whose logo includes swords. Ignore this action: Allowing Western airlines to service Saudi Arabia without reciprocity would presumably be too great a humiliation for the monarchy to abide. Cut off the Western airlines in return: Cutting off the Western airlines would unacceptably isolate Saudis from major markets and premier destinations. Permit non-Wahhabi religious items: That leaves the Saudis no choice but to accept the import of "Bibles, crucifixes, statues, carvings, items with religious symbols such as the Star of David." Further, once these materials are allowed, other benefits would likely follow, such as permitting non-Islamic religious buildings and services in the kingdom for the millions of non-Muslims who live there. Muslims who reject the Wahhabi interpretation of Islam would also eventually benefit from this loosening. Such joint action also sends a long-overdue signal to the despots of Riyadh – that Westerners have thrown off their servile obeisance to their writ. Who will be first to act? Which national government or municipality will arise from the customary dhimmi posture and ban Saudia (slogan: "We aim to please you") from its runways, thereby compelling the kingdom to permit infidel religious items, monotheistic and polytheistic alike, into its territory? Where are you Athens, Frankfurt, Geneva, Houston, London, Madrid, Málaga, Manchester, Milan, Munich, New York, Nice, Osaka, Paris, Prague, Rome, Vienna, and Washington, D.C.? If no government acts, what about a delegation of Christians, Jews, Hindus, Buddhists, and others boarding a Saudia flight with much publicity, openly displaying their religious artifacts, daring the airline to confiscate these? Or which public service law firm in those eleven countries will bring local human rights suits against Saudia as an arm of the Saudi government? This issue provides an opportunity for left and right to unite against radical Islam. Who will take the lead to confront Saudi discrimination, arrogance, and repression? Aug. 31, 2007 update: I published a follow-up article today, "Saudi Arabian Airlines Cleans Up Its Act," noting that the most offensive passage has been removed in English and Arabic from the Saudia website but also inferring that this does not mean any substantive change on the part of the kingdom in terms of permitting in religious materials. Feb. 5, 2011 update: SAA is expanding. 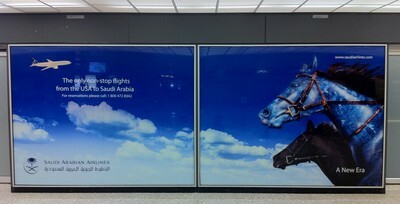 Take a look at the huge advertisement at the lower level of Dulles International Airport outside Washington, D.C.
June 23, 2011 update: Far from getting banned, Saudia is about to join the SkyTeam Alliance that Delta Air Lines heads up. For the possible implications of this development, see "Delta adopts Saudi 'no-Jew' fly policy"and "U.S. Jews Not Able To Fly On Delta Flights To Saudi Arabia." we will act to make sure they're excluded from United States airports, starting with JFK. … No city in the world has closer ties to Israel than we do, and yet Israeli citizens are being discriminated against right here at JFK. It's not only illegal; it's an affront to who we are. We won't stop with just exposing these practices. We'll pursue this with authorities in Albany and in Washington until Israeli nationals' rights are respected. De Blasio wrote to the director-general of Saudi Arabian Airlines, Khalid Abdullah Almolhem, pressuring him to change the policy against Israelis or face the consequences. July 21, 2013 update: Saudia general director al-Melhem (or Almolhem) has justified his airline's policy on the basis that Israel and Saudi Arabia lack diplomatic relations, therefore Israeli citizens are not allowed into Saudi Arabia, even in transit. Nov. 5, 2013 update: De Blasio is the next mayor of New York City. Will his threat to exclude Saudia become operational? Jan. 1, 2014 update: De Blasio is now the mayor. How long till Saudia gets the boot from New York's airports? Iris Eliazarov wanted to fly to London on Kuwait Airlines. Feb. 6, 2015 update: Over a year has gone by and one awaits for de Blasio to fulfill his promise vis-à-vis Saudia. Perhaps this will spur him on? 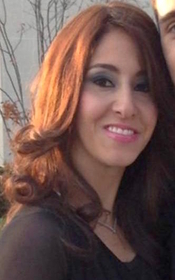 A Queens, New York, woman, Iris Eliazarov, 26 and pregnant, tried to board a Kuwait Airlines flight from New York to London on Nov. 1, 2014, but was denied entry because of her Israeli citizenship. She has since brought suit against Kuwait Airways. In her affidavit, she states that she takes "strength from the experience of Rosa Parks." The New York Daily News reports that she "may be getting a legal assist from top federal and state law enforcement officials. Federal Judge Roslynn Mauskopf Thursday ordered the offices of Brooklyn U.S. Attorney Loretta Lynch and state Attorney General Eric Schneiderman to weigh in on the discrimination lawsuit." And what about the mayor?